During the June 30 closing banquet of the 2015 Dominican High Schools Preaching Conference, participants unanimously approved the above statement of support for the Dominican Sisters of Iraq who were displaced from their home in Mosul, Iraq, by ISIS in August 2014. Almost all the Christians and many other groups have been driven from their homes or face persecution. 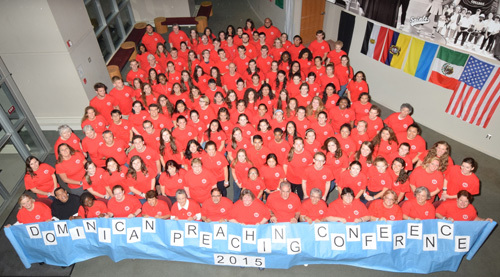 Nearly 100 students from 25 Dominican schools across the country attended the six-day conference, held at Siena Heights University, Adrian, Michigan. Participants learned that members of the Dominican Family can be found in almost every country around the world. The entire Dominican family has representation through the course of the conference, allowing the students to meet or learn about the friars, sisters, cloistered nuns, laity, associates, Dominican colleges and universities, Dominican Volunteers USA and Dominican Young Adults USA. Congregations of sisters and provinces of friars and lay Dominicans have met and engaged with the Iraqi sisters and friars and lay Dominicans. For more than 10 years, sisters from the congregation of St. Catherine of Siena of Mosul, Iraq, have presented at the high schools preaching conference, sharing their experience of ministering with their people. This past May, the last sister returned home after an extended stay in the United States. At a presentation about the history and relationship of the conference with our Iraqi sisters, participants were asked if they would like to craft a statement of support. Within less than an hour, a group of students drafted the statement, presented it to the group, and worked with additional edits and suggestions. After praying and reflecting for a day, the statement was affirmed by the participants. This was the 17th year of the conference, which gathers students to learn more about the Dominican spirit and to deepen their relationship with God. “This conference is more than just about preaching—it’s about growing spiritually while discovering new ways to show this growth in words,” said Maria Ritten, a student from Fenwick High School, Oak Park, Illinois. Beyond finding support and encouragement among the student attendees, the conference provides networking opportunities for administration, faculty, and students to share their best practices for liturgies and prayer services, social justice outreach and integration of the Dominican pillars of prayer, study, community and preaching.